Just before they took off. I have to share this story. I was out taking pictures yesterday at Garbry Big Woods Reserve. I was in a hurry to get home to take an important call, so I was setting in my car deciding if I had time for a walk. While I was setting there, this doe and her fawn walk out of the wooded area to my left. I watch them just casually walk across the open field, heading in the direction of the pond. It was early, so I was the only person around. She was nervous. I assume it was my car. (My Mini Cooper sets a reaction frequently:) I think it’s the red top. I was afraid to open the door because I new she would bolt. I took a few shots out the window, but they were not very good. The front glass does some weird stuff to photos. At some point, I saw a park ranger driving into the area. I knew he was not going to stop so I could watch the deer. I opened the door as quietly as I could but they were taking off. I got out, and stood there to see what happened. They went about 25 yards, then stopped to see if they were safe. That is when I took this picture. They were looking square at me, and my camera was focused on them. I took a lot of photos. It was a beauftiful scene. It was a great day for photos. I was able to get a few photos of a hawk, cardinal, robin, and saw a mink. Not bad for a rushed morning. And I was home for that phone call. What a georgous creature and stunning photo. I was driving between locations on my morning photo outing. I have several favorite spots, and sometimes I will stop at 2 to 3 locations. On Monday morning, I was heading to another location when I saw this dear. 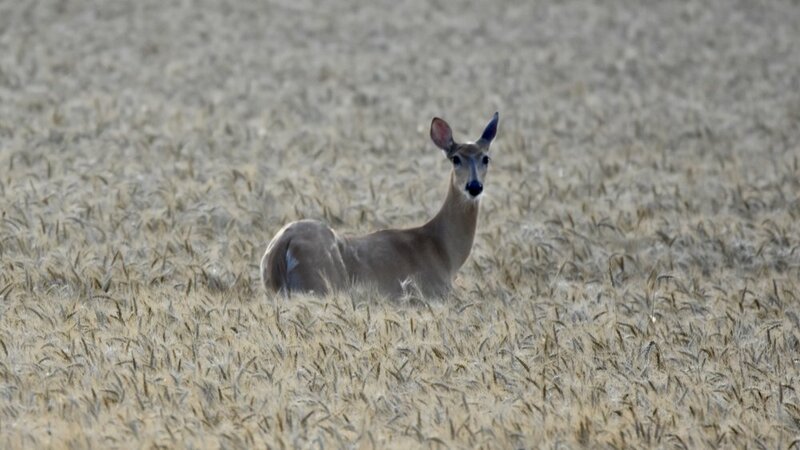 She was laying in this wheat field. I slowed down to see what she was up to. She stood up, and looked back at me, but did’t run. I stopped in the middle of the road. I was not sure how long I would have. I figured either a car would come up behind me, or she would bound off. We set there looking at each of their for what seemed like hours. I snapped several photos, she just watched. Beautiful. I am printing this photo. It will be on a sheet of glass, and will be ready to hang on a wall. It will be available next week. The price is $80. This is a special price. Click the button below to contact me, or you can text or DM me.